CHITWAN, July 1: The 'Rotary Musahar Model Settlement' constructed in Sisawar in ward no 7 of Ratnanagar municipality has been handed over on Saturday. 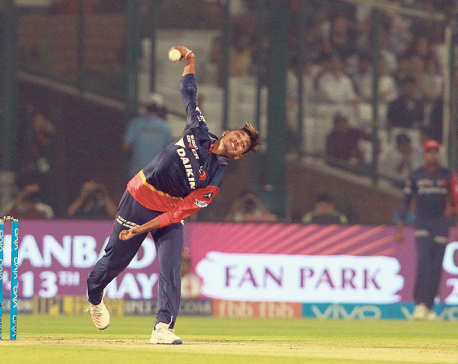 KATHMANDU, May 13: Nepal’s teenage sensation Sandeep Lamichhane was handed his first cap by Delhi Daredevils in their twelfth match of ongoing Indian Premier League 2018 in their home-ground Feroz Shah Kotla against Royal Challengers Bangalore. Lamichhane received the IPL debut cap by Daredevils coach and Australian legend Ricky Ponting. 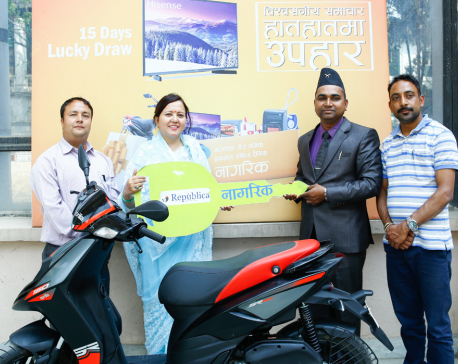 KATHMANDU, April 25: Director of Nepal Republic Media, Shova Gyawali has handed a winner prize to Shankar Karna Kyastha, Principal of Glory School Madhyapur, Thimi on Tuesday. 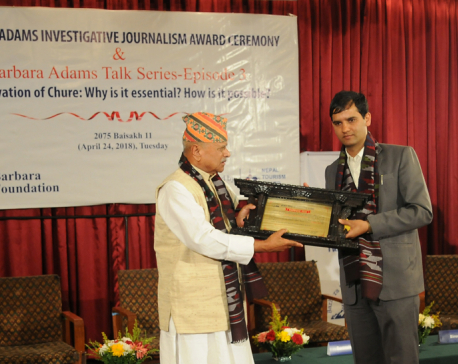 KATHMANDU, April 24: Dilip Poudel, senior correspondent of Nagarik Daily has been handed Barbara Adams Investigative Journalism Award-2017 today. KATHMANDU, April 17: Two 17-seat Y12e aircraft have been handed over to Nepal Airlines Corporation (NAC) amid a function here Tuesday. The aircraft were brought on subsidized loan from the government of China. RAUTAHAT, Feb 7: “There was a time when we used to dream about owning a modern house, while visiting the cities,” said 106 years old Ramkaliya Devi, who has spent most of her life in a dilapidated hut. “We had never in our lives imagined that some day we would actually own such a house,” she added. MIAMI, Jan 30: Former England captain David Beckham was officially awarded a Major League Soccer (MLS) franchise in Miami on Monday with hopes that the team will begin playing in 2020. KATHMANDU, Jan 1: The Nepali Congress Nuwakot district branch has handed over a memorandum to Prime Minister Sher Bahadur Deuba today, calling on the government to provide medical treatment to the people injured in course of the elections, including to Upendra Mishra. 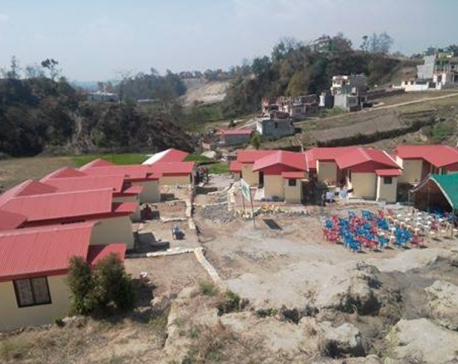 KATHMANDU, Dec 18: The newly reconstructed, earthquake-resistant building of Shree Kali Devi Primary School in Kavre District was handed over to the community on Monday. The project was jointly completed by the Asian Development Bank (ADB) and the Government of Nepal. PARBAT, Sept 29: An ambulance purchased using Constituency Development Programme's fund was handed over to the Thuli Pokhari Primary Health Care at Kushma Municipality-14 in Parbat district on Thursday. 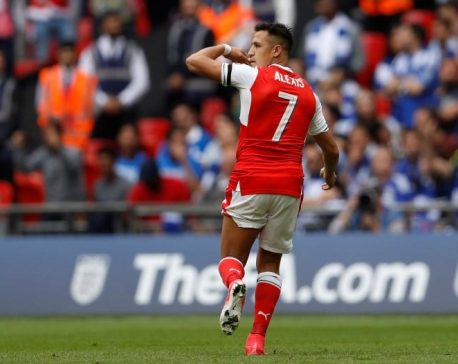 LONDON, August 24: Arsenal's Alexis Sanchez is fit to face Liverpool on Sunday and is focussed on giving "absolutely everything" for the team despite uncertainty over the striker's future at the club, manager Arsene Wenger has said. KATHMANDU, July 23: In a program organized by the Federation of Community Forest Users, Nepal in the capital on Saturday, stakeholders of various governmental and non-governmental organizations urged the government to form a local body for the management of community forests. KHOTANG, July 18: District Health Office (DHO), Khotang has recently provided medical equipment worth Rs 500,000 to various health posts of the district. BHIMDATTANAGAR (Kanchanpur), June 2: An Indian police team which was taken under control for arresting and transporting a Nepali national to India has been handed to the police office at Banbasa in India. BARDIBAS , April 9: Integrated Model Musahar Settlement constructed at Bardibas in Mahottari district would be handed over to the Musahar Community on April 14. 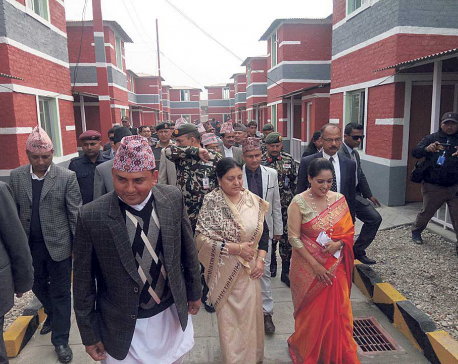 KATHMANDU, March 19: Twelve earthquake-resistant houses were handed over to twelve victims of the earthquake that hit Nepal on April 25, 2015 at Bhangal of Budhanilkantha-2, Kathmandu on Saturday. MALEKHU, Oct 20: Five health posts established in the northern belt of Dhading district were handed over to the Government of Nepal on Thursday. KATHMANDU, June 28:The District Court, Lalitpur on Monday has handed down life term to the murderers of Justice Rana Bahadur Bam.